Edmonton-based group of science fiction enthusiasts who read and discuss recent novels. This is the third of a three-part blog post about the historical invisibility of organized labour in science fiction, as well as recent works that address this absence. In the first two parts, we examined prose works both negative and positive. An additional post includes a list of all labour unions we are aware of in science fiction works. Employment has been a ubiquitous subject in film — and in science fiction film — but worker organizing has again been neglected. Some of the earliest science fiction movies feature clashes between workers and automation. 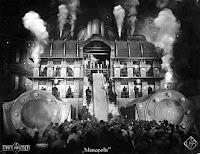 From the now-lost 1895 short movie The Mechanical Butcher to Fritz Lang’s 1927 classic Metropolis, filmmakers reflected the concerns of an era that was experiencing rapid industrialization as well as violent actions taken against the working class. 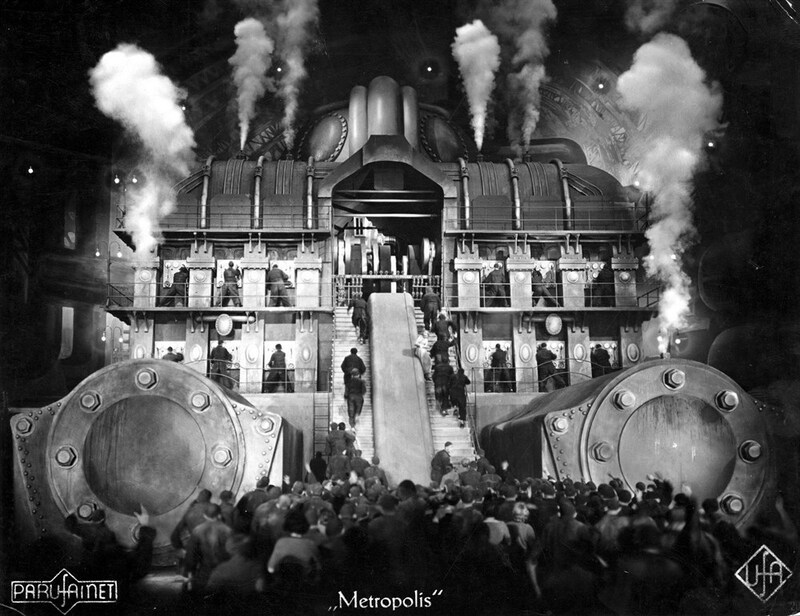 Possibly because of political sensitivities, many of these films made no overt mention of a labour union, but in Metropolis, the workers assert their rights through something similar to anarcho-syndicalist collective action, which may make it the IWW of labour movies. This treatment of labour and labour unions as a source of strife continues in cinema over the next several decades, though overt union representation is rare. Workers might revolt in a chaotic manner in a science fiction film (as in Stargate, Planet of the Apes or Solo: A Star Wars Story), but they are rarely organized — or effective — in their actions. and Garment Workers Union depicted in the 1951 Ealing Studios comedy The Man In The White Suit. The film revolves around the invention of an indestructible fabric by a mild-mannered chemist played by Sir Alec Guinness, and the subsequent attempts by business and labour unions to suppress the invention. The depiction of unions in this movie is broad and largely inaccurate, depicting them as collaborating with management and encouraging industrial sabotage. Most other labour unions depicted on screen in science fiction up until the 1990s relegate the labour conflict to a tertiary storyline. 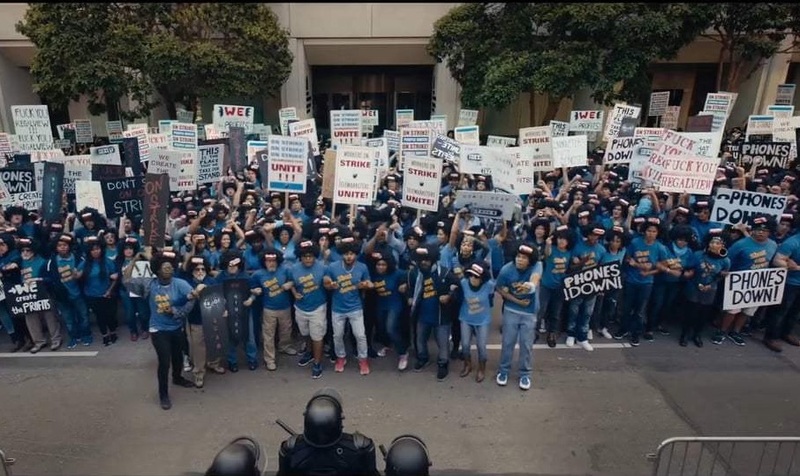 In Robocop, the government’s decision to deploy the title character is driven by a police union strike. In the real world, in most North American jurisdictions, police officers are unable to strike because they are deemed to be ‘essential services,’ but in the dystopian future depicted in Robocop, police services have been privatized and are now run by the corporation Omni Consumer Products. Because the police are no longer public servants, they are able to (legally) walk off the job. 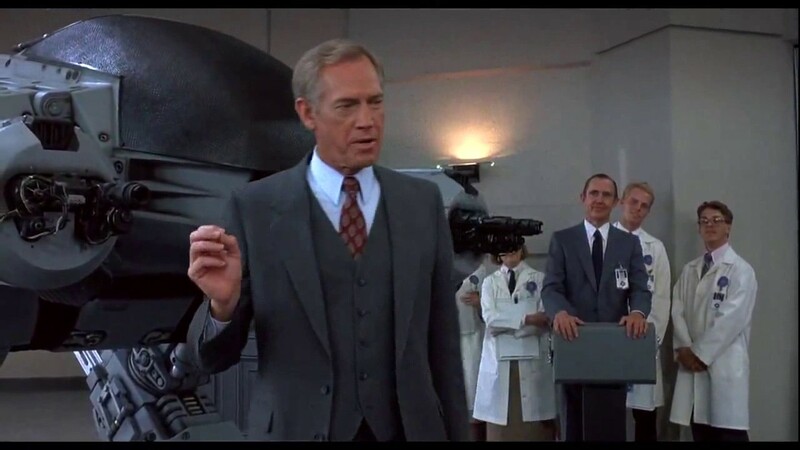 One aspect of Robocop that is worth noting is that the strike has been engineered by the corporation, the CEO of which deliberately withholds adequate resources (police vehicles and equipment) and acts in bad faith when it comes to pensions and wages. The strike is therefore shown as justified, but when push comes to shove, the most heroic police officers Anne Lewis, Alex Murphy, and Warren Reid all cross the picket line. about privatization of public services. showing that they are more concerned with doing their jobs than they are their own livelihoods. It is unsatisfying that workers’ rights questions remain unresolved in the movie — the strike is ended but wages, pensions, and funding are all unaddressed. Robocop presents us with a prescient warning about the low-wage agenda that is marketed under the term ‘privatization,’ but its depiction of worker organizing and worker solidarity is sadly lacking. There are at least two prominent portrayals of labour organizing in mid-1990s science fiction television series: Babylon 5 and Star Trek: Deep Space Nine. They offered very different — but equally unsatisfying — portrayals of labour organizing. Babylon 5’s episode 'By Any Means Necessary' shows a labour movement that is belligerent and badly led into a violent dockworkers’ strike — only the unconventional thinking of the station’s military governor prevents the situation’s violence from escalating. Two years later, in Deep Space Nine’s episode 'Bar Association,' we are shown an example of solidarity organizing to address the plight of underpaid waiters and waitresses in Quark’s Bar. Once the employer has compromised on wages, however, it is suggested that a union is ‘no longer needed.’ In both of these examples, the labour movement is shown as being an unruly rabble whose actions need to be kept in check. In the labour movement, this behaviour might be described as unfair bargaining practices. As the product of a collaborative and corporatized structure, television might be a compromised medium when it comes to offering nuanced depictions of class struggle. Published text narratives — though subject to some editorial controls — are usually credited to a single author with a greater level of intellectual freedom and interest in a personal brand. Because a single author is better able to take personal responsibility for their ideas and their words, they are less likely to be constrained in what they say. Last year, two very different examples of labour union depictions in science fiction hit the screens, and were surprisingly positive portrayals. The last two episodes of South Park’s most recent season 'Unfulfilled / Bike Parade' features a storyline about employees at an Amazon warehouse who decide to assert their right to a safe workplace in the wake of an accident. Although South Park is as irreverent in this episode as you’d expect it to be, the plight of the workers — and the tensions between picketers and picket-line crossers — are handled surprisingly well. while trying to assert their workplace rights. To Bother You. A surreal workplace comedy with science fictional elements, Sorry To Bother You uses a story about the unionization of a call centre to explore larger themes about worker solidarity, the erosion of middle-class incomes, and the hyper-competitiveness encouraged by corporate culture and capitalism more broadly, pitting one worker against another. This may be one of the finest examples of labour union depiction in science fiction to date. Overall, society’s (and science fiction’s) failure to imagine new forms of economic organization reinforces the neoliberal paradigm. Given science fiction’s speculative mandate, this is even more pronounced in the genre and especially its cinema and television (which reach a wider audience than literary forms). The marginalization of unions in science fiction is significant — and symptomatic. As Mark McCutcheon and Bob Barnetson argue in their paper Resistance Is Futile, themes that are omitted from popular culture are often consigned to not merely to impossibility, but to unthinkability. 1. Robocop: Your description of the plot is accurate although I find it a bit odd to criticize a satirical action movie for not depicting pension negotiations. But I do have a problem with your summary on the list page: "Negative depiction - Antagonistic towards progress, endanger the city by going on strike". You've acknowledged that the union is justified in striking, so why are you blaming them for doing so? As for "antagonistic towards progress"... if by "progress" you mean the prospect of being replaced by cyborgs made out of the mangled remains of their colleagues, I am OK with them pushing back on that, and I think the movie is too; it certainly is not a techno-positivist story in a Golden Age style. 2. 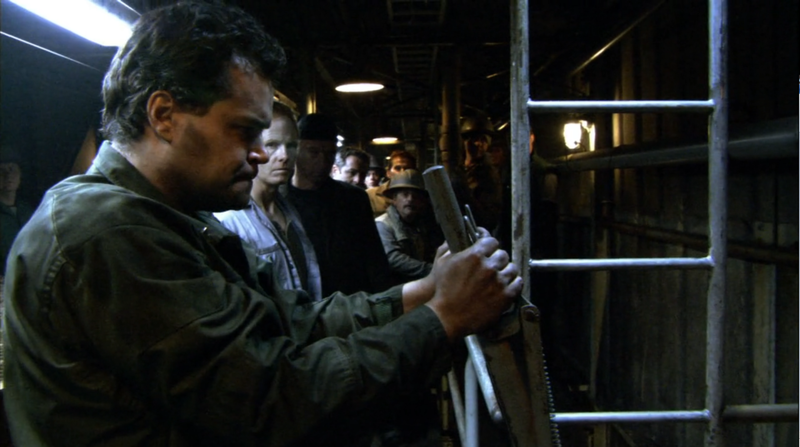 Battlestar Galactica ("Dirty Hands"): I'm completely bewildered by your interpretation of this episode. Adama is by no means an entirely sympathetic protagonist: again and again throughout the series, he abuses his power and makes authoritarian gestures that would not be tolerated in any democracy, and other characters rightly call him out for it. This is a major theme of the show. Threatening to kill Tyrol and Cally (IIRC he also threatens to kill all of Tyrol's deck crew, who aren't even in the union) is possibly the worst thing he's ever done. The episode presents the union's grievances as entirely legitimate, and Tyrol is by almost any measure a more sympathetic character than Adama. The show is not optimistic about the prospects for a just society under emergency conditions-- the outcome of this plotline is mixed at best, as the union's actions do result in a more equitable system of labor assignments but they still don't really have any rights-- but it absolutely does not present Adama as having acted well. Since you yourself describe this as "unfair bargaining practices", I'm really confused as to what your complaint is; in what way is it anti-labor to depict management as being unfair? Open Discussion — What's worth considering for the ballot in 2019? Open Discussion — What's worth considering for the ballot in 2020?